Ensus consulting BVBA is a consulting and services firm operating at the interface between science, government and industries covering biological, biocidal, (agro)chemical and environmental products and technologies. Our core value is to offer services, advice and solutions that help our society to live more sustainably. Dr. Jaak Ryckeboer started his consultancy services in 2003, after 10 years of research and industrial experience gained in applied biosciences, more specific in the field of environmental technologies including hygiene issues associated with organic wastes, water disinfection technologies, etc. 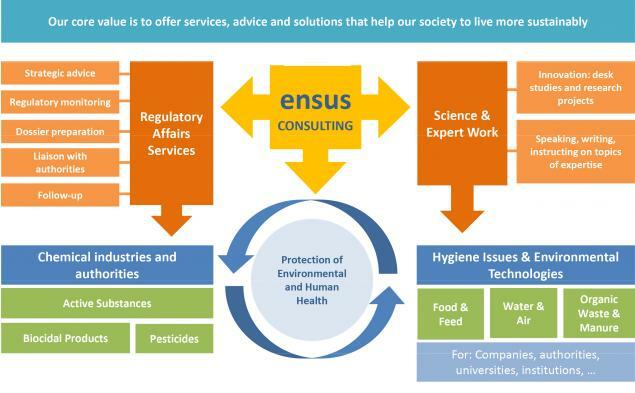 These early consultancy services were complemented with regulatory work in the field of biocidal products and its active substances, which is currently forming the main activity of Ensus Consulting BVBA.